The condition is known as “prosopagnosia” / “facial agnosia”, or in less medical terms: “face blindness”. (“Prosopagnosia” actually literally means: “face ignorance”. “prosopon” = “face”, “agnosia” = “not knowing” or “ignorance”). Once thought to be incredibly rare, with only 100 or so documented cases up until the last decade or so, it’s now thought that around 1 in every 50 people suffers from this condition; though for most, they just have a really hard time recognizing people by their faces. For instance, in one study, a person with this condition was shown a picture of Elvis Presley and thought it was Brooke Shields. For some, the condition is so severe that they can’t even recognize their own face, let alone someone else’s. There are also instances of people with prosopagnosia who are unable to tell whether what they are looking at is a face at all or simply a picture of an oddly shaped rock or just random objects. To be clear, face blindness isn’t a problem with the people’s ability to see, nor do people with this condition have memory problems. They just can’t, or have difficulty with, recognizing faces. Specifically, when most people see faces, their brain processes the face as a whole, rather than by its individual parts. 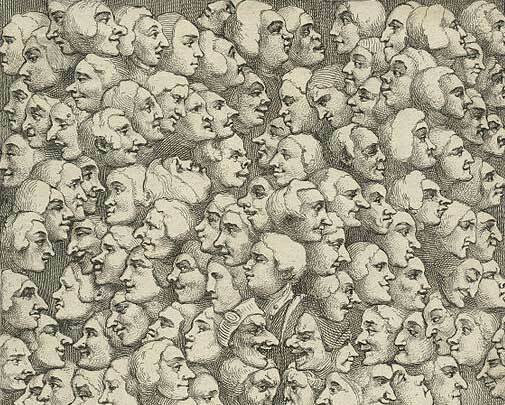 For people with prosopagnosia, they see the individual parts, but are not capable of perceiving the face holistically, making it incredibly difficult to recognize someone by their face. It turns out that there is a special part of our brain that has facilities for “seeing” faces and recognizing them later. This shouldn’t be too surprising as most people know from experience that when they see people from other racial backgrounds they aren’t very familiar with, there is often that politically incorrect thought, “They all look the same.” However, if you spend time around a lot of people in that other race, you’ll quickly find that your brain begins to be able to distinguish between people that not long before you thought all looked the same. Once this happens, you’ll easily and quickly be able to distinguish between such people and might well wonder how on Earth you used to think that people of that ethnicity “all looked the same”. This hints at the fact that there must be some facility in your brain that trains itself to recognize certain types of faces and, once trained within a culture, makes these distinctions much more readily. Now, this preceding example doesn’t definitively demonstrate that there is indeed a specific part of the brain that handles processing faces. But, it turns out, that is the case. 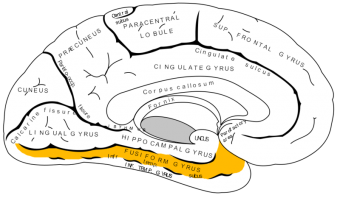 The part of the brain that’s thought to not function properly in the cases of prosopagnosia is known as the fusiform gyrus, This handles things like visual word recognition, color processing, and face and body recognition, among other things. This system of the brain allows people to more readily distinguish faces than they would, say, one rock from another rock, or other similarly complex inanimate objects. For people with prosopagnosia, they rely more on the brain’s facilities of object recognition, which takes much more training to distinguish one similar looking object from another. This more generic object recognition system is how an arborist can instantly recognize what tree a leaf came from, even if it’s extremely similar to another leaf from a different type of tree. They can do this through significant training. Similarly, a geologist can recognize what type of rock something is even if it strongly resembles a different type of rock- again, they can do this only after quite a bit of experience and training. For most people, we simply learn faces quickly and easily without conscious thought using the special “facial recognition” mechanism of the brain designated for this, rather than relying on the generic object recognition system. It was thought until relatively recently, that most people with this condition came by it simply from damage to their brain (via strokes, tumors, severe head injuries, etc.). But more recently, it’s been discovered this isn’t the case at all and far more people suffer from prosopagnosia from birth, though most have it mildly enough that they can adequately compensate by doing things such as paying particular attention to a person’s hairstyle, body shape, posture, voice, etc. Another trick often used by people with prosopagnosia to compensate, not in recognizing people, but in at least not appearing rude, is to adopt the practice of always looking down when walking, so that they can act like they don’t see people, in case they come across someone they know, but don’t recognize. When they do encounter someone, many on the more extreme side often adopt the practice of being overly friendly to everyone, in case the person they are talking to isn’t a stranger. In the course of the conversation, they try to determine whether it’s someone they actually know or not and who the person is. How clever people are at naturally masking face blindness is “probably why [the disorder] went unnoticed for so long,” says Dr. Thomas Grüter of the Institute of Human Genetics. As one woman with this condition, Cecilia Burman, said, “People think I’m just snobby… It makes me really, really sad to lose new friends because they think I couldn’t bother to say hello.” Burman’s fairly low on the spectrum in that she has trouble recognizing her own mother’s face and even has difficulty recognizing her own face in pictures or the mirror. The problem isn’t just about saying “hello”, though. Not surprisingly, people with face blindness also tend to have problems interpreting facial expressions. This can make it difficult at times to properly gauge a person’s mood or the like, which can further make someone with face blindness seem insensitive or misinterpret what someone’s saying. In the end, there is no known cure for prosopagnosia and treatment options have proven fairly ineffective to date. The primary way to treat the condition is simply to teach people to pay attention to things like hair style and color, body types, etc. to help recognize people. As most born with this condition already do this naturally, there really isn’t a whole lot in the way of actual treatment that can help them… yet. People on the Autistic spectrum (including Asperger’s, which incidentally is a name distinction that’s soon to be going away in favor of just calling everyone on the spectrum “Autistic”) usually demonstrate some level of prosopagnosia. While people with prosopagnosia have difficulty consciously recognizing faces, studies have shown that they are subconsciously recognizing the faces in that there is a skin conductance response when they see faces of people they know, but aren’t recognizing. Given that many of the people who were born with prosopagnosia seem to have close relatives with the condition (often quite a few of them), it’s thought that face blindness is directly caused by a defect in some dominant gene, which results in the brain’s mechanism for being able to holistically see a face not developing correctly, making it harder to distinguish one from another. In fact, if you have prosopagnosia, there is a 50% chance that a child you have will also inherit it. One of the tell-tale signs of prosopagnosia is if someone generally has difficulty following the plot of a TV show or movie because they can’t keep track of which character is which. Because of this, kids with prosopagnosia will often strongly prefer cartoons, where characters almost always wear the same clothes and often sound very distinct when they talk. The earliest known case of face blindness was documented in the 9th century. This idea was generally ignored until the 20th century. It was given its name, prosopagnosia, in 1947 by German neurologist Joachim Bodamer, who studied the disorder, including studying a man who, after a head injury, could no longer recognize his own face, nor the faces of his friends and family. I have Asperger’s (many of us aren’t on board with getting rid of the name and consider there to be distinctions worth preserving) and I recognize faces as well as the average person. I do know of many others who have some difficulties with prosopagnosia. It must make socializing a great deal more difficult when it’s already hard for other reasons. Makes working in retail with repeat customers interesting, anyway! I have a mild-to-moderate case of face-blindness. In my work environment, as long as I meet with people in their offices, I “recognize” them. Put people from different groups into the same conference room with me, and it’s a lot harder to do so. My wife and close friends know I’m resistant to change, but some don’t know the reason why. For me, even a significantly different hairstyle on a female colleague will throw me off. I was once having lunch with a friend from the office, seated at a window table. At one point, a woman on the sidewalk tapped on the window and waved at me. I somewhat blankly smiled and waved back. That evening, my wife asked who I had had lunch with, as I had seemed to be engrossed in the conversation when she saw me at lunchtime. The fact that she had a new hat (and was supposed to be twenty miles away) had a lot to do with my not recognizing her. I get by, for the most part, and am social enough, but even meeting friends out of normal context can throw me for a slight loop. Still, there are worse problems in life, and in my role (engineering), this issue doesn’t really impact me all that much. I’ve have mild face blindness, but with one oddity in my particular case. Usually when I first see someone I’ve no idea who I’m looking at, especially if they’ve just changed their hairstyle. But, oddly, once I realize who they are all the details of their face snap into place for me. All the same I prefer to avoid being around many people. When half the people in the room look identical crowds are interesting in a not-at-all-good way. Even so that in our modern social communication the ability to recognize faces is neccesary to act like a “normal” human being(the texts shows why), but never thought of that ability to be “human”. I learned this from the game ‘999’. I have known for several decades that I often recognize people more readily by their voices than by sight but had no suspicion that this condition was common enough to have a name. It has cost me a few friendships, some of which are regrettable. One of them could have been more than merely embarrassing; at an evening meeting of a private club at which I expected to meet my betrothed I could not find her but I did notice a particularly attractive young lady whom I felt sure I knew but could not place. In time she came over to me and asked me why I was avoiding her. At the sound of her voice I realized instantly that she was my betrothed; she had done something with her hair that had thoroughly befuddled me. Her reaction justified my love for and trust in her; this year we celebrated our 45th wedding anniversary. Our marriage has been the most consistently rewarding experience of my life.